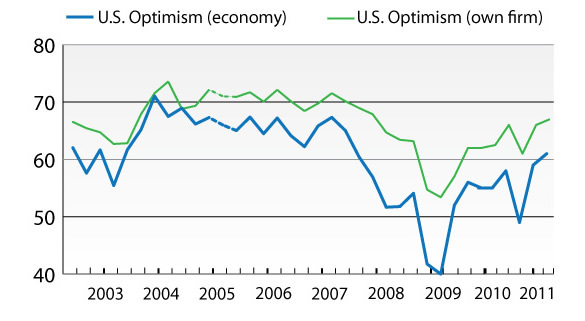 On March 30 the Business Roundtable’s CEO Economic Outlook Survey was released for the 1st quarter. The March Duke/CFO Magazine Global Business Outlook Survey was released on March 9. Both contain a variety of statistics regarding how executives view business and economic conditions. It should be interesting to see how well the CEOs and CFOs predict business and economic conditions going forward. I discussed various aspects of this, and the importance of these predictions, in the July 9 post. 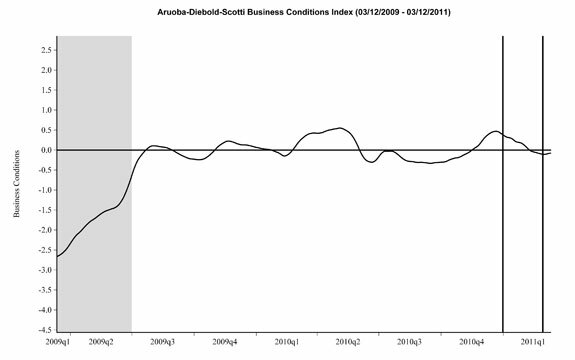 This entry was posted in Business, Economic Forecasts and tagged Business, CFO and CEO Confidence, Economic Forecasts on March 31, 2011 by Ted Kavadas. On March 22 MacroMarkets released its March Home Price Expectations Survey results. The survey detail (pdf) is interesting. Of the 111 survey respondents, only 9 (of the displayed responses) foresee a cumulative price decrease through 2015; and of those 9, only two, Gary Shilling and Mark Hanson, foresee a double-digit percentage cumulative price drop. Gary Shilling remains the most “bearish” of the survey participants with a forecast of a 19.68% cumulative price decline through 2015. The Median Cumulative Home Price Appreciation for years 2011-2015 is seen as -.5%, .98%, 4.03%, 7.14%, and 11.15% respectively. For a variety of reasons, I continue to believe that even the most “bearish” of forecasts (seen in Gary Shilling’s above-referenced forecast) will prove too optimistic in hindsight. Although a 19.68% decline is substantial, from a longer-term historical perspective such a decline is rather tame in light of the wild excesses that occurred over the “bubble” years. I have written extensively about the residential real estate situation. For a variety of reasons, it is exceedingly complex. While at this time many people have an optimistic view regarding future residential real estate prices, in my opinion such a view is unsupported on an “all things considered” basis. Furthermore, there exists outsized potential for a price decline of severe magnitude, unfortunately. I discussed this downside, based upon historical price activity, in the October 24, 2010 post. 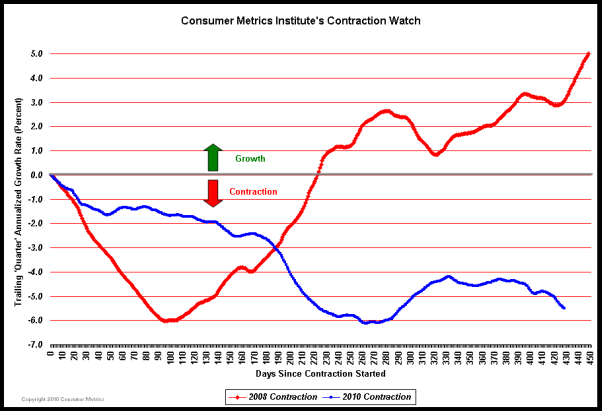 This entry was posted in Real Estate and tagged MacroMarkets, Real Estate, real estate bubble, residential real estate on March 29, 2011 by Ted Kavadas. 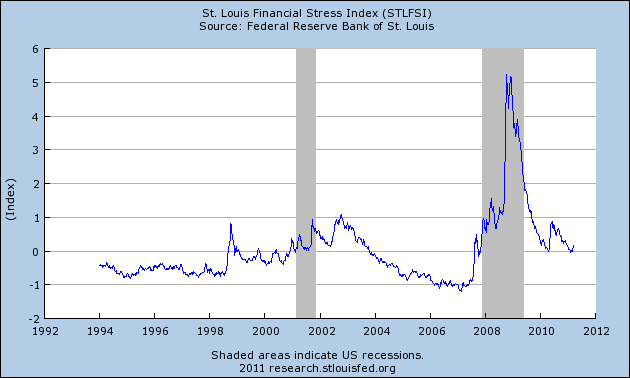 One doesn’t hear much about the STLFSI (St. Louis Fed’s Financial Stress Index) with regard to measuring stress in the financial system. Here is a document (pdf) that explains the construction of this index. My thoughts on this index are varied and complex. For now, I am simply posting it as a reference, as I find it interesting. One might note that at present levels of .155, the reading of the STLFSI is very close to the levels that immediately preceded the two recessionary periods indicated in gray. 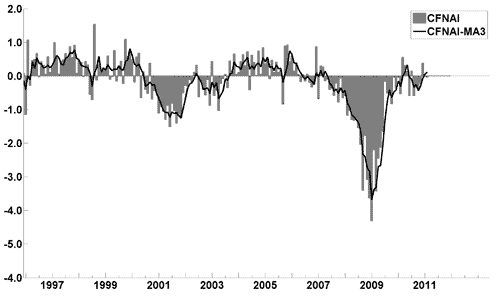 This entry was posted in Economic Forecasts and tagged economic forecasting, economic indicators, STLFSI on March 28, 2011 by Ted Kavadas. In this post, I would like to highlight comments made by Federal Reserve officials (Bernanke and Sack) as well as another made by Greenspan, as I believe that these official comments regarding the stock market’s “wealth effect” and related themes deserve recognition and scrutiny. I could write extensively about this collection of comments. For now, I will say that until recently, the idea of prominent Federal Reserve officials publicly talking of the stock market as an instrument for creating a “wealth effect” would have seemed rather foreign. I see considerable peril, for a variety of reasons, in having officials make these types of comments. Can an asset class such as the stock market be reliably counted upon as a means unto itself to create sustainable, broad-based wealth? Especially if, as I believe, the stock market is currently a bubble? I think we should reflect upon our (national) experience in housing before answering this question. This entry was posted in Ben Bernanke and tagged Alan Greenspan, Ben Bernanke on March 27, 2011 by Ted Kavadas. On March 21, Gallup released results from an annual survey in which they gathered information on American’s concerns about 14 major national issues. “Americans’ economic anxiety has not abated over the past year, as 7 in 10 Americans continue to tell Gallup they personally worry a great deal about the economy. This has ranked as Americans’ top concern on this measure since 2008. Healthcare led the list from 2002 through 2007 and remains among the top five today. This entry was posted in Uncategorized and tagged economy, Gallup on March 23, 2011 by Ted Kavadas. Surprising to whom? The bubble episode surprised so much of the world—Greenspan and Bernanke believed that markets knew how to handle risk, self-regulation was adequate and the banks had incentives to manage risk and so forth and so on. We saw that it isn’t true—in a very dramatic way. That wasn’t surprising to me because my Nobel Prize was about the economics of information and this notion of agency theory, that the people who are making decisions do not necessarily reflect the interests of those who they are supposed to be serving. The kind of incentive schemes that were being employed by firms, banks and financial institutions weren’t consistent with any model of rational behavior other than exploitation. If you believe incentives matter, something untoward was going to happen. At the level of markets, securitization had some fundamental flaws, because you didn’t have the incentives to monitor or manage them and created a moral hazard. To our leaders and erstwhile gurus, it came as a very big surprise. You have a market economy where incentives do matter, but in which they aren’t always aligned. This entry was posted in Moral Hazard and tagged Joseph Stiglitz on March 21, 2011 by Ted Kavadas. In Volume 9 there are a couple of comments made, at roughly the 40:36 mark and 42:40 mark, by Congressman Clarence J. Brown and moderator Robert McKenzie, respectively. In essence, they are commenting upon how the experience of The Great Depression has had a great psychological impact upon the country, and as such drives many of our economic fears and actions. This commentary is especially notable as the series was filmed in 1980. This mindfulness of The Great Depression seems highly elevated in current times as well. This is seen in numerous ways. For example, Ben Bernanke’s background includes being considered a foremost scholar of The Great Depression. Furthermore, during and after “The Financial Crisis” there were innumerable mentions and comparisons to The Great Depression, many by policy makers. I have highlighted many of these instances in past posts. This entry was posted in Depression and tagged Milton Friedman, The Great Depression on March 16, 2011 by Ted Kavadas.